Summary: Lisa Patton won the hearts of readers last year, her book Whistlin’ Dixie in a Nor’easter became a sleeper-success. Building on a smashing debut, Lisa’s poised to go to the next level—because whether in Vermont snow or in Memphis heat, Dixie heroine Leelee Satterfield is never too far from misadventure, calamity...and ultimately, love. Last year I read and enjoyed WHISTLIN' DIXIE IN A NOR'EASTER by Lisa Patton -- you can read my review here. So when I heard that Ms. Patton had a new book out, I jumped at the chance to read it. Little did I know until I picked up the book that YANKEE DOODLE DIXIE is actually a sequel to WHISTLIN' DIXIE IN A NOR'EASTER. I was definitely looking forward to finding out what happened to Leelee once she returned home to Memphis and started her new life. YANKEE DOODLE DIXIE left off right where WHISTLIN' DIXIE IN A NOR'EASTER left off; however, I am pretty confident in saying that this novel works well as a stand-alone. There are quite a few references to Leelee's life in Vermont, but Ms. Patton does a great job of catching up the reader with her past, so I can say that the books don't have to be read in order. However, I personally am happy that I read WHISTIN' DIXIE IN A NOR'EASTER first because I liked knowing Leelee's background and all of the obstacles she overcame during her time in Vermont. Plus I enjoyed knowing a little bit more about the Leelee's relationship with her love interest. I think one of the things that I most enjoyed about YANKEE DOODLE DIXIE is the character of Leelee. She is very much a Southern gal and I think she's just a hoot! After surviving her time in Vermont, there is no doubt that she is one strong woman... and that she has an awesome support system of friends. When Leelee returns home to Memphis, she faces an entirely different set of challenges than those she faced in Vermont; however, she still finds the inner strength to pull herself up from the bootstraps and make a new life for her and her daughters. In addition, her wonderful set of girlfriends are always "there" for Leelee. Another thing I thought was very well done in YANKEE DOODLE DIXIE was the setting. I loved that Leelee was back in her element in Memphis, and I think Ms. Patton certainly brought that city to life in this novel. I loved all of the Southern references, and especially those about Elvis! Some of those scenes with the impersonators were sure a riot! And that brings me to my next point. YANKEE DOODLE DIXIE is a very funny book. I mentioned that Leelee is a funny character and gets herself into some sticky situations, but her friends are pretty darn funny too. I haven't had the opportunity to meet Ms. Patton, but I understand from Kathy/Bermudaonion that she is a funny woman. Her humor definitely shines through in this novel! Finally, I would be remiss if I didn't mention that there was some romantic scenes in this novel. While I always claim that I'm not a big fan of romance stories, I did enjoy those parts of this story. Of course, it wasn't a major element of the novel, but still I thought they were a lot of fun! One thing's for sure, little Miss Leelee sure has the ability to get some pretty fantastic-sounding men! So I guess you could say that I enjoyed YANKEE DOODLE DIXIE for many of the same reasons that I enjoyed WHISTIN' DIXIE IN A NOR'EASTER. There were great characters, a great setting, loads of humor, and even a little romance! Overall, I'd have to say that this novel had a cute story and kept me entertained; however, it's the themes about the strength of women and their friendships that really touched me heart. 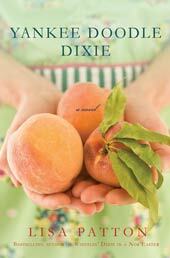 YANKEE DOODLE DIXIE is just a feel-good book about how wonderful women and their relationships can be! I think readers who already consider themselves fans of Ms. Patton will enjoy reading about Leelee's latest adventures in YANKEE DOODLE DIXIE. However, I also think fans of chick lit and women's fiction will enjoy this novel too! I haven't read this author before, but her books always seem to be enjoyed by her readers. I may have to check them out. Thanks for the review. I've been meaning to read the first one because everyone loved it so much and now I see that I'm two behind. :) Definitely going on my list. I'm always so jealous of Kathy and her Book Your Lunch events! I have never read a book set in Memphis so I should remedy that; I love to find out about a city through it being background in a book! I cannot wait to read this book; I loved Whistlin' Dixie! Thanks for the review! I really need to read this series. I adore the cover themes and the stories sounds just adorable. Thanks for the review! These sound great - adding to my TBR! I can't wait to read this one! I loved Whistlin' Dixie! I've never heard of either of these, but the sound like fun reads. I will have to give them a try. Great review! This series looks like something I'd really enjoy. I've seen other reviews before, so this one's already on my list. Thanks for the reminder to pick it up. I recently won a copy of this book, but I'm waiting my copy of WHISTLIN' DIXIE to arrive so that I can read them in order. So glad to know that you really enjoyed this sequel.